Does it bother you to see a dog’s head hanging out of a car window? Sure, they are probably enjoying the fresh air – but is it safe? No, it is not safe. 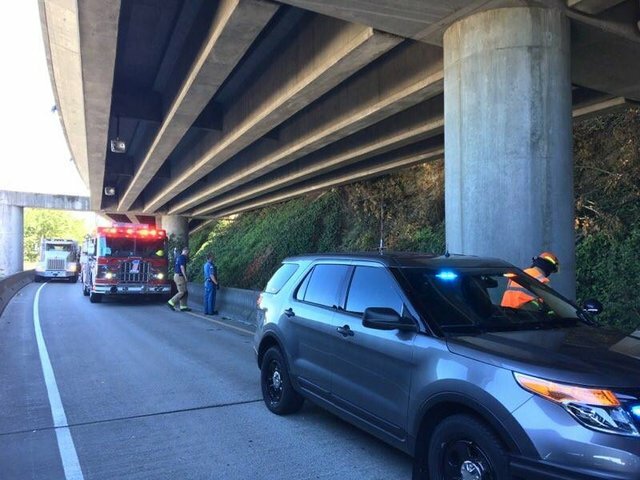 Hunter and his owner were driving along a freeway overpass located in Tacoma, Washington when Hunter saw something and jumped out of the window! 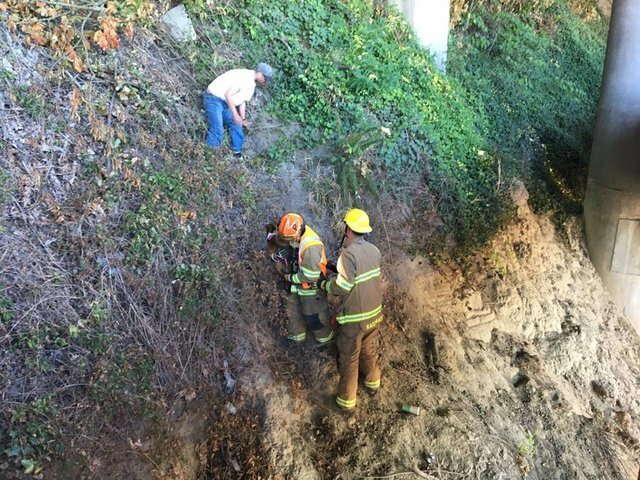 Hunter was not injured in the fall – but he landed on a steep cliff and got tangled in ivy. The ivy actually saved his life, but now Hunter was stuck. 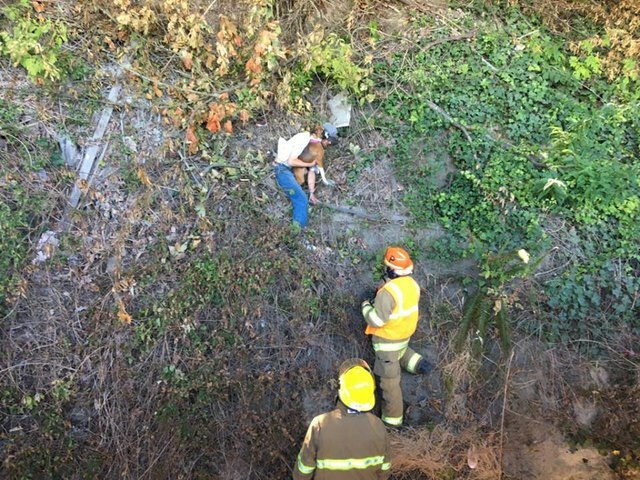 Local firefighters and troopers from the Washington State Patrol arrived on the scene to try and get Hunter unstuck. Brooke Bova, one trooper, said they were working as fast as they could to get to Hunter, but were trying to figure out a safe way for everyone. 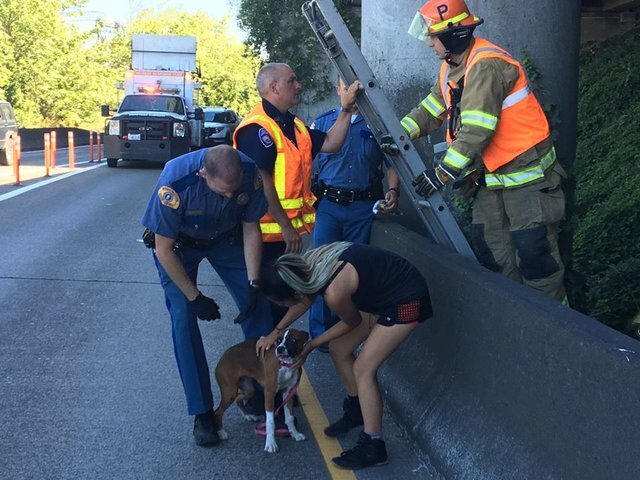 Then the first responders were approached by a homeless man who offered to climb up and get Hunter down. 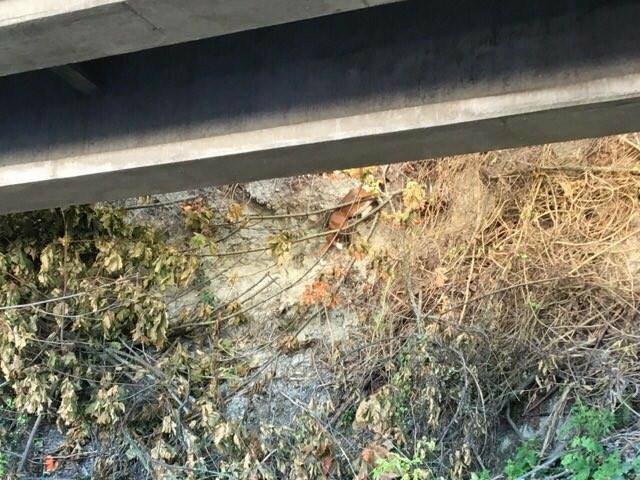 The homeless man said he lived under the overpass and was quite familiar with the terrain. No one asked him to help – he just did it because it was the nice thing to do! Bova was happy to say that Hunter appeared to be in good health, but was understandably shaken after his near-death fall! Please don’t let your dog hang out of the window of your car – they need to wear a seat belt just like people! For your dog, going out for a ride in the car is fun enough, they can enjoy the breeze from the safety of the seats like everyone else! Safety first!